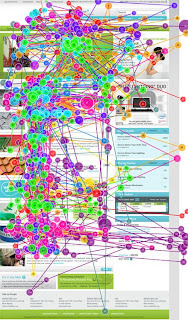 Ad Blindness is a phenomenon commonly found with eye tracking research. Ad blindness also includes “right rail” blindness, a similar occurrence due to the placement of tower and stamp-shaped ads loaded up in the right column of a webpage. Rebeka Sedaca wrote about reclaiming the right rail in 2006. As seen in many of our tests, right rail blindness can also be linked to user behavior; e.g. the use of the mouse scroll wheel. In a website usability and eye tracking test at Mediabarn, we noticed an avoidance of the right rail column. Upon further inspection, what we noticed was a behavioral difference between those who used the scroll wheel on the mouse while scanning the page, and those who used the mouse to move scrollbar of the Web browser. Users who used the scroll wheel remained focused on the main content of the webpage, while users who used the mouse and scrollbar looked away from the main content, scanned to the right, and positioned the cursor on the browser’s scrollbar. Although this action was quick, this change in focus allowed for a greater possibility for these users to notice the content in the right rail. Our test data, although small in sample, showed scrollbar users had more fixations over right rail elements than those who used the scroll wheel. Or, in other words… the scroll wheel was doing its job, making scrolling easier for users and allowing them to stay focused on the content they wanted. Because these behavioral findings were not the focus of the study, there were no follow up questions with the participants regarding this behavior or whether they noticed the content in the right rail or not. However, it does illustrate that the use of technology (e.g. the scroll wheel on the mouse) can impact how people use and view a webpage. Therefore, as technology advances, new tools and user behaviors are introduced, and as these tools and behaviors become more common place, then page layout design can also be impacted, evolve and change. Today, many blog layouts have reclaimed the right rail, as Sedaca wrote, by placing local navigation links in the right column of the page. But, how else might technology and user behavior change page design and layout? We look forward to observing what’s ahead. Posted in eyetracking, user research, uxlab.